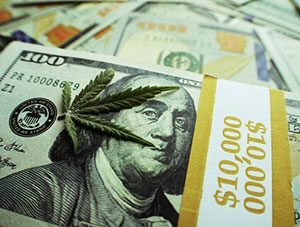 Back on March 29, I told Money Morning readers about a "backdoor marijuana investment" strategy in the $10 billion marijuana industry through Microsoft Corp. (Nasdaq: MSFT). The potential profit opportunity was from the May 4 MSFT option call. And if you followed along, congratulations. You've made a 107% profit in less than a month, with our $0.96 option call now trading at $1.99. Microsoft isn't a typical pot stock, but it's becoming a major player in the industry. It formed a partnership with cannabis compliance firm KIND Financial in 2016, where KIND would use Microsoft's cloud to run its software. On top of its partnerships in the $10 billion legal cannabis industry, Microsoft is just one of the best tech stocks to own right now. The tech giant expects to generate $20 billion this year just in commercial cloud revenue. You can find all the details here about how I uncovered this Microsoft call as a profit opportunity, but I wanted to give a quick recap in case you missed it.